It’s chocolate heaven for lager lovers. 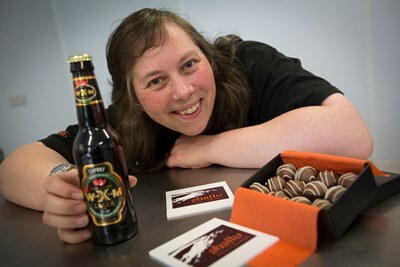 Innovative chocolatier Jo Edwards is launching a new milk chocolate truffle with a heady ingredient – Wrexham Lager. Jo, 40, whose company, Aballu Truffles, is based in Rossett, near Wrexham, will be unveiling the new truffles at the Hamper Llangollen food festival on October 18-19. The new truffles are already a big hit at Wrexham Lager, the iconic brand that was first brewed in the UK back in 1881 and served on the ill-fated Titanic in 1912. Jo sent a batch to be tested by the discerning palate of company director Mark Roberts. But the Wrexham Lager Truffles were intercepted by head brewer Ian Dale, a self-confessed chocoholic, who promptly scoffed the lot. Jo is a regular at Hamper Llangollen – recently named as one of the top 10 food festivals in the UK – which is being supported by the rural development agency, Cadwyn Clwyd. Cadwyn Clwyd’s contribution comes via the Rural Development Fund for Wales 2007-2013, which is funded by the European Agricultural Fund for Rural Development (EAFRD) and the Welsh Government. Jo came up with the idea for using Wrexham Lager when she was considering how to develop a chocolate treat aimed particularly for men. And being Wrexham born and bred, and with her parents having run a pub, including a taste of Wrexham Lager in her new creation was the obvious choice. Jo said: “I was looking at coming up with some ideas for a new truffle which would be particularly aimed at the male of the species. “I grew up in Wrexham and Wrexham Lager is closely associated with the town. Although the new truffle is aimed at men, the taste has gone down a treat with women who have been lucky enough to try out the new creation. Jo said: “I am still in the process of developing the exact taste but I asked some local food producers who I know to give it a try as part of the trial process. “They all happened to be female and they really liked it so the truffle will go down well with men and women. Jo said fans of Wrexham Lager will be able to identify the unmistakable taste of the well loved lager when they bite into the truffle. She said: “The lager is used to get the texture and flavour of the truffle. “There is enough in there to get the Wrexham Lager flavour coming through. The talented chocolatier said she was delighted to be able to launch her new product at Hamper Llangollen. Jo started her Aballu truffles and artisan chocolatier business in 2006 and has attended the festival every year ever since. She said: “There is always a great atmosphere at the festival and you get a real variety of top class food and drink. The festival was named by the Independent newspaper as one of the Top 10 food festivals in the UK and Jo predicted the event would have another successful year this year. She said: ”I have always done well there and it is a fantastic event. Jo added she would be continuing to come with more unusual and innovative concoctions in the future for her chocolate creations. She said: “I am always looking to do something different, something a bit unusual. “I have put together ingredients just to see how they work out and they have been successful. “There is chilli ginger and lime for example or blackcurrant and rosemary. Jo’s innovations have also secured her a host of prestigious awards. Her chilli ginger and lime treat won her a prestigious Great Taste Award. She said: “It was great to have it recognised. I have won two Great Taste Awards now. “We were also named the 2nd Most Loved Confectioner in the UK as part of the Best of “Local and Loved” competition. “It is based on the number of testimonials that your customers take time to write and submit to Best Of. Also starring at Hamper Llangollen 2014 will be two of Wales’s top chefs. Graham Tinsley, the star of ITV’s Taste the Nation and a former captain of the Welsh Culinary Team, will be joined in the show kitchen by the ever popular Dai Chef, who is now based at Bodnant Welsh Food, the centre of excellence for Welsh food in the Conwy Valley. Cadwyn Clwyd’s Agri Food Officer, Robert Price, believes this year’s festival is going to be one of the best ever. He said: “Thanks to a whole host of indigenous companies like Aballu Truffles, North East Wales is rapidly establishing a reputation as a centre of excellence for high quality cuisine.